Is the coalition collapsing? Last weekend, as the political temperature soared alongside the unseasonal heat, the question couldn’t help putting itself. Nick Clegg said the party he chose to govern with was part of a “rightwing clique, a rightwing elite”. Chris Huhne refused to rule out resigning, accused the prime minister and chancellor of telling “blanket untruths”, and threatened legal action. Vince Cable suggested he’d rather be in government with Labour, since “we need to make sure the progressive majority wins elections in this century”. There was heady talk of Liberal Democrats quitting the cabinet or David Cameron calling a snap election. But cooler weather should bring calmer thinking. The runup to next Thursday was always set to strain ministerial tempers, because the referendum campaign was always likely to resemble recent general election ones – in other words, be remorselessly negative. Some of the claims made by both camps have been questionable, to say the least. And the stakes are high. For Cameron, a victory for AV would spark Tory tumult, with raging Conservative MPs turning on him for making a concession too far to his coalition partners. No wonder his posture on the referendum turned from relaxation to frenzy a few weeks ago, when he rushed out to campaign for first past the post and chivvied Tory donors into stumping up for the No campaign. 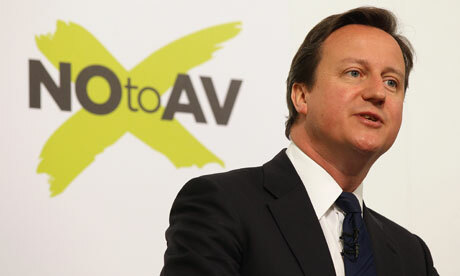 For Clegg, the defeat of AV could bring even worse humiliation. The case he made to his party for coalition with the reviled and detested Conservatives was built on a bargain: we’ll give the Tories government if they give us electoral reform – or at least a good chance of it. That deal looked shrewd when the yes and no campaigns were running neck and neck in the polls. But with postal votes already being returned and the no campaign pulling away with a double-digit poll lead, it looks misjudged. Worst of all, Clegg himself is a driving cause of that likely no vote. The yes campaign should have been an anti-establishment, post-expenses scandal insurrection against the cynicism of the political class. Clegg, however, is the double-dealing of that class incarnate: the man who broke his word on tuition fees. A No vote would leave him vulnerable to denunciation by the former Lib Dem council leaders who will lose local control next week, to a dramatic Cable resignation, to a possible leadership challenge. But there are solid reasons to believe that, whatever happens next Thursday, the coalition show will go on. Neither partner stands to gain from an early general election. The Lib Dems would lose seats as former left-of-centre supporters switch to Labour. Sure, the Conservatives would gain constituencies from Clegg’s party. However, they’d also lose some to Labour, who are currently running roughly 10 points ahead of their general election performance. Some of those points would doubtless vanish during an election campaign: Ed Miliband isn’t ready for a poll and Labour is short of cash. But not all of them would and, under the present boundaries, the Tories have to be eight or so points ahead of Labour to scrape a bare majority. If they couldn’t do it last May, they can’t do it now. And were Cameron to call a snap election which produced a hung parliament, he could kiss goodbye to a second coalition with the Lib Dems: after all, why should they hitch themselves again to a man who had just spurned them? The plain fact is that, for all last weekend’s huffing and puffing, this is a marriage of political convenience which it suits both partners to sustain. The prime minister needs the Lib Dems to give him the Commons majority he couldn’t gain on his own. And the Lib Dems, having gone into coalition and signed up to cuts, cannot easily quit now that their fingerprints are on the axe. Cameron and Clegg are thus bound together. If you take a high view, they’re acting nobly and in the national interest. If you take a lower one, they’re trapped together in a quest for power, compelled to keep company, stuck in the middle with each other. As the old song has it, they’re “just two lost souls swimming in a fish bowl, year after year”. This article was amended on 29 April 2011. It originally stated that Nick Clegg had described the Conservative party as a “rightwing clique, a rightwing elite”.